When I booked (for midday, on the dot of opening) I was told that the restaurant was hosting a function at 1:30pm and we’d need to be finished lunch by then. Not a problem – I only take issue with this kind of thing if the venue waits until I turn up to tell me I need to clear my table at a certain time. On arrival, it turned out that due to the function we were the ONLY table in the restaurant so our experience is probably not representative. Grace is divided into three areas: a bar, the very black and white restaurant and the beer garden. In the restaurant you can quite comfortably spy on what is going on in other parts of the venue, so it’s optimal for people watching. At first, service was reasonably attentive but that definitely dropped off as our lunch went on. One of my friends described the staff as having a ‘morning after’ feel and either they had indeed had a big night on Saturday or they were woefully understaffed. Let’s be charitable and say understaffed. For main course we showed a great lack of imagination with THREE people ordering the salmon with pea puree and heirloom tomato salad. Comments on this different wildly: bland, salmon perfectly cooked, salmon overcooked. Make of this what you will! I ordered the slow cooked pork belly with daikon, heirloom carrots and Japanese mayonnaise. The pork was excellent (with a lovely expanse of crackling) and the daikon made an excellent counterfoil to the meat’s richnesss and fattiness. However, the carrots were utterly undercooked. To the point that they were almost, but not quite, raw. I can only imagine that someone forgot to the put the carrots on and there was a mad rush to get them on the plate – in which case I would have just preferred them raw! The final main was the jerk chicken which got the seal of approval. Two cuts of meat: one on, one off the bone, served with white beans and tomato. Apparently this was beautiful. Some of us wrapped up with desserts where the hit of the day was the peanut butter and jelly icecream sandwich. That actually sounds pretty horrible to me, but apparently it was good enough to warrant a trip back just to eat that one dish alone. The apple pies didn’t quite receive such accolades but there were no complaints. So food wise, Grace ticks some boxes – I’d go back and eat there, as would at least a couple of my dining companions. Some people may find that they require two courses: portions aren’t massive but I’d describe them as sufficient (I had entrée and main and only needed a cheese toastie for my dinner). But service wise – they really need to get some more staff on and get some MUCH better communicating happening. When our entrées arrived, we waited a good 5 minutes for the final dish (the chorizo) to arrive – we actually had to ask after it. Taking of our dessert and coffee orders was slow – although nowhere near as slow as getting hold of the bill! The real disappointment was the way in which the whole function thing was handled. We knew we had to clear the table by 1:30pm and, aware of the time, I actually asked a staff member if she would like us to move to the bar or garden for dessert and coffees. She insisted that wasn’t necessary but it was subsequently quite obvious that other staff members were getting grief from the function (which is reasonable – if you’re paying for use of an area you don’t wand random lunchers hanging around!) and all starting to look a bit harried. 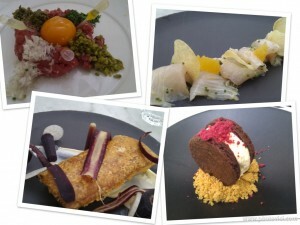 So – while Grace serves up some good, and beautifully presented food, it can be a touch uneven. But where it really needs to pull its socks up is its service and attention to detail. Clean plates, cutlery and glasses should be de rigueur and communication between sufficient staff makes for a stress free experience for everyone. While I would be happy to go back, I’d be cautious about a blanket recommendation of the restaurant – especially if you are a pedant when it comes to service. Caveat emptor. * I don’t normally take photographs of food in restaurants – I think it’s inconsiderate to both my companions and other diners. Because we were the only people in the restaurant, and the food was so pretty, these are very much the exception to that rule. I’m generally interested in what people think on the etiquette on taking pictures of food in restaurants. If you’re not using a flash and your fellow table sharing companions don’t mind .. I don’t think there’s an issue at all. What does everyone else think? I’ve had the pork belly at the Establishment as well and the carrots were all but raw as well. Not something I feel suited the dish.